The Saints Heritage Club is comprised of alumni who graduated from The College of St. Scholastica 50 or more years ago. 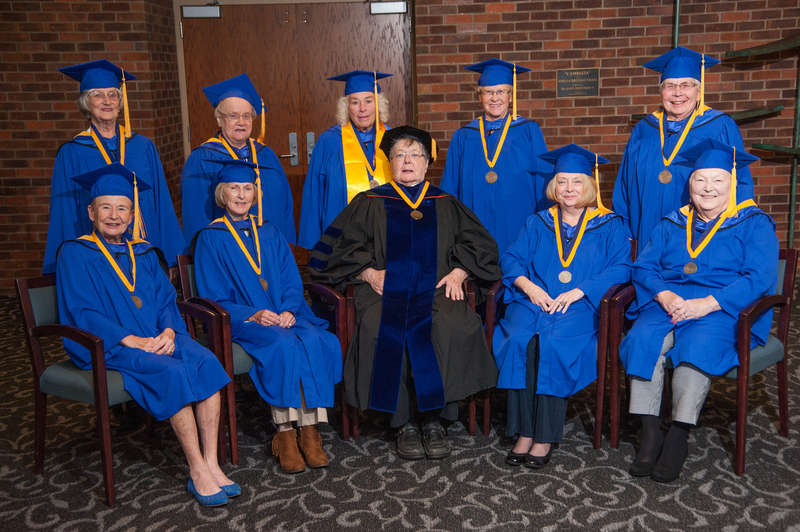 Several annual events are hosted to honor these remarkable alumni; women who have helped make St. Scholastica the place it is today and through their wonderful work created a strong reputation for the institution and its graduates. Members of the Saints Heritage Club gather together for a group photo before participating in the Opening Convocation ceremony by joining students in the annual procession. Opening Convocation is the ceremonial start to St. Scholastica's academic year, and an expression of the College's Benedictine Values of hospitality and community. The colorful event features faculty in caps and gowns, bagpipers in traditional costume, and a welcome to new members of the new freshman class. Recognition is also given to the Saints Heritage Club, whose members are are St. Scholastica graduates from 50 years ago or more. For more information about the Saints Heritage Club or these events, please contact Alumni Engagement at alumni@css.edu, 218-723-6071, 866-935-3731.